A mentally disturbed and socially awkward man develops a fervent obsession with the film The Human Centipede and makes it his mission to develop his own human centipede creation. 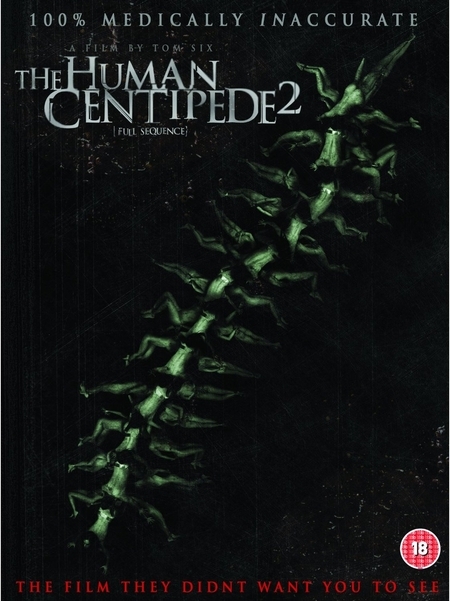 If The Human Centipede 2 has anything going for it worthy of praise, it is the unique, risky, yet somewhat pretentious, premise that director and writer Tom Six developed for the sequel. When it was first announced that a sequel The Human Centipede was being made, many wondered just where the story could go after the rather close-ended finale that the original contained. Thus, moving the action of the sequel to the “real world” makes for an unexpected and intriguing story that is rather unique in the annals of horror sequel history. Wes Craven did something similar with New Nightmare where the premise was that the success and impact of the previous Nightmare on Elm Street films allowed the character of Freddy Krueger to materialize in the real world and terrorize those involved with the making the Nightmare films. Here, the situation is very similar; Six’s perceived success and impact of his first film has allowed a real life monster to emerge in the form of Martin, portrayed with a grimy and unsettling ferocity by Laurence R. Harvey in a Fright Meter Award nominated performance that certainly is one of the most disturbing depictions of a villain in quite some time. 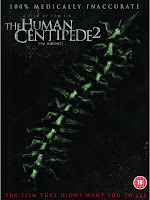 The Human Centipede 2 is shot in black and white, which, because of the dark content of the film, is rather effective, though does not match the intent of the film. Much has and will be made of the sheer brutality of this film, and make no mistake about it, this film is ultra-brutal and severely depraved. Unlike Dr. Heiter from the first film, Martin has absolutely no medical training at all. His administering of anesthesia consists of bashing his victim’s head with a crowbar. Additionally, when he begins building his centipede, his surgical work (and that term is used loosely) is mainly trial and error in nature and ultimately ends up being performed with a dirty old staple gun and rusty kitchen knife. These scenes truly are cringe worthy and will have even the most hardened gore fans squirming in their seats. However, besides the unflinching images of torture and the performance by Harvey, the film lacks any real substance and transcends into being an attention seeking vehicle for director Six. And while the film’s premise is refreshing for a sequel, it is not executed particularly well or as grounded in reality as it could have been. Some believability would have been much more impactful considering the direction the sequel goes with Martin being a “real” fan of the first film, but so many plot points are utterly unbelievable that, unlike Craven’s New Nightmare, we are constantly reminded that this is a film pretending to be something more. For example, does no one at Martin’s place of employment where he obtains his victims, a rather bustling urban parking garage, notice the countless people who have abruptly disappeared? And in the film’s most baffling example of absurdity, how does Martin, who does not squeak even a single word for the entire film, convince agents for working actors and actresses that he is conducting auditions for a highly revered and successful filmmaker? In this manner, he is able to trick actress Ashlynn Yennie, who portrayed Jennie in the first film, to travel to meet him, believing she is auditioning for a Tarantino film. Obviously, there are several blatant clues that things aren’t what they seem that she gleefully ignores. After capturing and detaining her as his centipede’s “head,” one has to wonder if he did not believe her agent would quickly begin searching for her whereabouts, particularly when the agent has Martin’s phone number and location. It could be argued that Martin is so mentally disturbed that he does not consider this, but some of his actions throughout the film dictate otherwise. Besides the plot improbabilities, there is also any lack of character development or tension. None of the victims who are selected to make up Martin’s twelve person centipede are given any additional characterization beyond their initial caricatures, such as “pregnant lady” or “tough guy.” Essentially, as a result, there is no character to root for and further evidence’s that the film’s sole intention was shock value and controversy. Ultimately, those disappointed with the lack of gore and brutality that the first film promised will be beyond satisfied with this film. However, that alone cannot save this film from being the one-note, vehicle that it is. To borrow the words of literary genius Shakespeare, The Human Centipede 2 is a paramount example of being full off sound and fury, ultimately signifying nothing.